Jet Pulverizer, Inc. offers three different types of mills, each with its own unique characteristics and operational advantages. Selecting the most appropriate type of mill, size and materials of construction allows a user to specify a Micron-Master® pulverizer that is essentially a custom design perfectly suited to the application. The standard Micron-Master® mill is the original single-chamber jet energy pulverizer design. It is the simplest and therefore the least expensive of the family of Jet Pulverizer mills. The feed injector discharges directly into the grinding chamber at one location. This simple design is ideal for materials that are easily ground and especially materials that are sticky or subject to smear build-up on the mill’s interior surfaces. 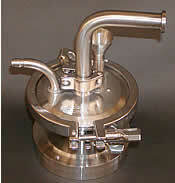 It also offers the advantage of being quickly and easily cleaned, making it a popular choice for pharmaceutical processing. The concept of the orbital mill is based on our first Micron-Master® patent and, with many engineering enhancements over the years it is still our most popular design.Earlier jet mills used a single injection port to introduce the raw material into the milling chamber. In the orbital Micron-Master® design, however, the material to be processed is introduced into the milling chamber through several ports, each located just ahead of the process air input jets. This multi-point injection ensures even distribution of material in the milling chamber at all times, resulting in greater efficiency and shorter processing times. 4 sizes from 12″ to 30″. Throughput rates of 30 to 3,000 lbs/hr. The volute-style mill is a modification of the Orbital style mill and is also usually a bottom-feed, bottom discharge design. The primary difference between the two is in the design of the feed injections system. In the volute mill, product is injected into a chamber designed to precisely maintain a uniform feed pressure throughout the grinding chamber. 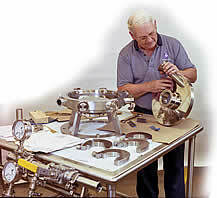 This design allows more process classification of the product. And, also, this design reduces the primary impact of the material from the feed injector, yielding much less abrasion when processing high inertia products. This considerably extends the life of wearable parts in the mill. One of our standard jet mills, with the many sizes, styles and available options they provide, will probably meet your needs. For your especially demanding or unusual applications, however, we are more than ready to create one-of-a-kind mills with precisely the capabilities you require.The basic Micron-Master jet mill design lends itself well to challenging applications. It is exceptionally flexible, making it readily adaptable to a broad range of applications and materials. And, our in-house design and manufacturing capabilities, our 55+ years of jet milling experience, plus, perhaps most important, our Can-Do attitude all provide fertile ground for developing and implementing fresh ideas and solving especially demanding problems.